A food memoir about women in the kitchen and history in the making. Food = Story. This is a photo of Juney, my grandma holding me. My mom, BA as in Betty Anne is sitting next to her. Our Pekingese, Shaggy is on my mom’s lap. Shaggy bit me under my nose when I was a young child. He had a sensitive spot and if touched, he would bite. Otherwise, he was about as Zen as they come. My sister and I would put him on top of our collie (like cowboy in saddle) to provoke him into movement. Shaggy was like a monk — quiet and spiritual. He was a kind dog. I wish I could go back in time and ask my grandma all the questions I have for her now. What was it like to go to Cuba in the 1930s? Tell me about Speakeasies? Did you go without telling Granny Dell? I have my little notepad and write her messages to keep a diary and include it ALL. Grandma was a humble woman and very private. She was equally fascinating and is certainly the main character of this memoir. Juney’s story of her past as a gourmet executive chef and business woman didn’t matter at this moment in the photo. What mattered most to her was she was a grandma — she was Grandma. That was the role she loved the most. Funny, what we can get stuck on. 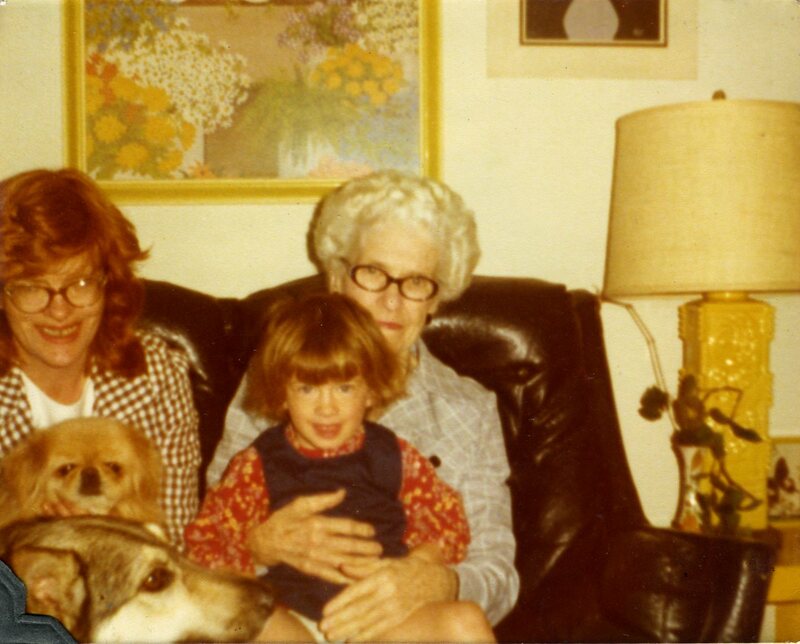 I have a deep desire to know every exact truth about my grandma, mom, and great-grandmother, but I can’t really. We are private creatures as humans and most people (besides journalers and writers, don’t share those private moments and thoughts in our heads). But I am on a quest to find the truth of my Elizabeths — Elizabeth Odell (great-grandmother — Granny “Dell”), Elizabeth Odell Welch (grandma — “Juney”), Elizabeth Welch Miller (Mom — “BA,” “Betty Anne,” “Betty”) and me (Megan Elizabeth Miller Oteri, memomuse). Categories: Uncategorized | Tags: ancestors, business women, chefs, cooking, dogs, family history, Food, foodies, German Shepards, gourmet food, grandmas, great-grandmothers, Memoir, moms, Pekingese, progressive era, Prohibition, relationships, remembering, So Who Do You Think You Are?, Temperance Movement, WCTU | Permalink. © Megan Oteri and Evanston Community Kitchen, 2017. Unauthorized use and/or duplication of this material without express and written permission from this site’s author and/or owner is strictly prohibited. Excerpts and links may be used, provided that full and clear credit is given to Megan Oteri and the Evanston Community Kitchen with appropriate and specific direction to the original content.